This took me a while to figure out, but I finally did it! So I thought I’d share the tip! First of all, you do need a Google+ account. 2) Under your Profile Photo is a link that says Change Photo, click on it. 3) Then upload, or find the photo of your choice in your albums, then add. 4) Repeat Step 4 and add a different photo. 5) When you’re happy with the various Profile Photos, click on the Done Editing button on top. 6) You should be back on your profile page. Now click on the Profile Photo and watch it switch to your other photos! Pretty cool huh? :) You can test it out on my profile photo. Join in on the conversation on the Original Google+ thread. My friend recently upgraded to an iPhone and asked how she could send photos to her friends. Inspired by my friend, I wrote a tutorial on how to send MMS on an iPhone. 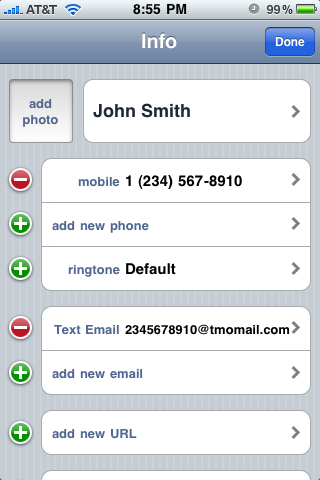 So in this example, let’s pretend our friend John Smith lives in the US, his cellphone number is 1 (234) 567-8910, and his cellphone carrier is T-Mobile. To get his phone’s email address, we would need to append his 10-digit phone number to carrier’s email address format. So John’s mms email would be 2345678910@tmomail.net. Copy and paste their number into the email field. Remove any special characters. If you have the iPhone 3.0 OS, press down on the number, and menu will pop up. Select “Select All” and then “Copy,” then “Cancel” on the top left. Now edit the number and remove all special characters, and append the correct carrier email. If you are running iPhone 2.2.1 or lower, skip the copy/paste steps and add in the number manually, appending the carrier email. Now go to the Photo app and find the photo you want to send. This will add your photo into the Mail app to send. Tap on the “To” field and a plus will show up. If the user only has the one email account, it’ll select it by default. If the user more than one email account, select one by tapping on it. 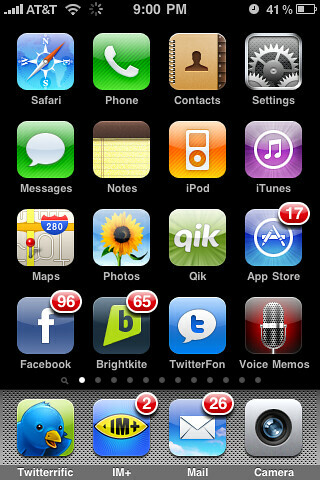 In the latest iPhone OS upgrade, we were allowed to have up to 11 viewable pages of apps. But if you look in the image to the right, you will see that there are 12 pages! So how did I do that? This was a trick I discovered while moving around my icons. First, you have to be an app-aholic and have 11 pages of iPhone apps (and more hidden ones since they can’t be displayed). Then move some of the default apps you do not use like “Weather,” “Stocks,” “YouTube,” “Audio Memo,” etc. to the last page. Now take one icon from the 10th page and drag it over to the 11th page. This will force the last icon to be booted off the page and into the iPhone abyss! Now download another app to replace that empty space. And magically, a 12th page will be created with all the apps you weren’t able to view on it. I repeated the same steps and was able to make a 13th page. Itâ€™s a nice trick, especially if youâ€™re an iPhone app addict like me. There never seems to be enough pages! I think forcing a default icon off the pages will bring it back on an extra page, but I’m not quite sure. I was able to create the extra pages a few times, and after much testing, I was unable to duplicate it the 5th time. If you see a logical pattern or explanation on how to do this, please let me know. I can’t seem to bring back the 13th page, and would like to. ;) Also note, this is not a jailbroken iPhone. UPDATE 11/22/2009: Additional note, this was tested on iPhone OS 3.0. However, it has been working in the updated versions of iPhone OS as well. I’ve stopped creating extra pages because the moment I sync with iTunes, only 11 pages will be displayed. As mentioned by Jeff K. below in the comments, moving the “Voice Memo” icon seems to be the trick to creating an extra page. Sometimes it is necessary to get the ID value of the last record you inserted into a MySQL database. For example, let’s say you have a shopping cart function that added records into the database. But you need to print out a receipt that includes the item tracking number. And this tracking number would be the record’s ID value, which is also the PRIMARY KEY of the table. An easy way to do this in PHP is by using the function mysql_insert_id(). NOTE: This will only work for AUTO_INCREMENT fields. Pretend STEP 1 is a form with a list of items. If you change the QUANTITY of the item, and submit, you will be at STEP 2, which is the sample code below. I recently updated my browser to FireFox 3.5 and discovered a very useful feature. While looking at the source code of my webpage, I noticed that all anchor links were clickable. Clicking on them will let you view the source code of that link. Clicking on image links will display the image. This comes in very handy since I look at the source code of my projects often to make sure scripts are outputting the correct HTML codes. I just learned this new feature for the iPhone/iTouch from Cali. There’s a way for your to screen capture in your iPhone/iTouch. Step 2: Tap the Power button. You’ll see the screen flash, and your screen shot was taken. So easy! To access your new image, click on the Photos button and all your photo albums will show up. Your image should be in the Saved Photos album. Then you can easily add these new images online through your Facebook, Myspace, or other apps. In the above image, you can see that all you have to do is type your link first, and then put the words you want it to link to in parentheses. I found this out by accident while typing something.. and have been using this trick ever since.Â Now you can too. ;)Â Enjoy your Plurk Tip of the day! Wow, my name was mentioned on The Neal Show! Thanks Jeff! Thanks Neal! As for the media upload problem, it may be the Visual Editor breaking the code. I remember embedding a flash video once and my post just kept breaking every time I edited it. I ended up turning the Visual Editor off so I can paste HTML code without the editor changing it. Go to the “Users” tab, and find your author (usually ‘admin’). This will then give you only the basic buttons when editing. For more great Adobe Photoshop Videos, check out Adobe TV and xTrain Training.